It's shocking that these ingredients can result in a hummus flavor, but it does. 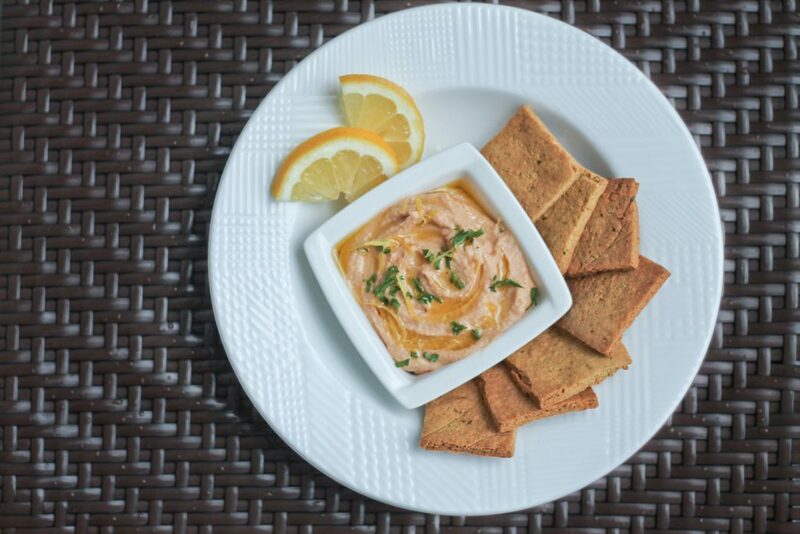 Paleo hummus is a great dip for vegetables or crackers and as a sauce. 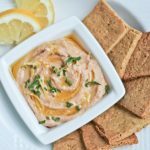 I admit it: in the past year I've made and played with this Paleo Hummus recipe many times and in that time I've always wondered if it was “hummus” or “humus”. I can tell you that it is definitely not “humus”, as its definition is “fully decomposed organic matter, sometimes used in gardening to improve the fertility of soil”. Now we know. I got to catch up with a bunch of friends from school this weekend who I haven't seen in a while. It's come to my attention that almost everyone is married now. I think there are only 2 of us in the group who are single. That wedding thing is catching. And expensive. Last year I had 5 weddings to go to. I think 3 this year. There should be one big mass ceremony. Once a year. Or a wedding week. Kinda like graduation ceremonies at big universities, how different programs are scheduled for their ceremonies all within a couple days. Think about that week-long party! And all the people you'd meet! Now that would be the way to connect all the singles, no? But it would never work. Brides need their day, right? I get it. But it's cool. Gets everyone together for mini-reunions. It's weddings and funerals, right? So obviously this is the more fun of the two. Hey, do you have a go-to wedding gift that you can suggest? I need help. Maybe a gallon-o-Paleo hummus (Not humus. Unless they're big into gardening). Stay tuned: I will show you one of my favorite uses for this hummus. Next week. ***Update: Favorite use: Hummus Omelette. See all of our Paleo Greek Weeks recipes here. It's shocking that these ingredients can result in a hummus flavor, but it does. And it's great! This hummus is a fantastic dip. Steamed broccoli is a great match. Surprisingly no they are not, they can cause inflammation in some people. I have an issue with my thyroid, and subsequently avoid soy beans. This article is technical, but a good explanation. As always, listen to your body, and your health care professional, some people can eat them with no problem, or with moderation. But if you are suffering from leaky gut, inflammation or a hormone imbalance, legumes may be an issue. I just saw a recipe for a beautiful beet hummus made with chickpeas on Cooking Stoned. After seeing yours, I’m thinking of using cauliflower as a base. Have you tried that combo? A sweet beet hummus? No, I haven’t. The only sweet hummus I’ve had was with pomegranate. But if you try, be sure to let us know how it goes. I made this tonight….not bad at all. I prefer flavored(like red pepper) hummus….but this was very close in consistency and taste to normal hummus. I will be playing around with this, maybe with other nut butters like macadamia. Yeah, I haven’t played with other flavors yet, but when you do please keep us posted! can tahini be subbed instead of almond butter? Are you asking about flavor for this recipe? I’m not sure, I haven’t tried it but I would think that yes it would work. Might have to play with the amounts of other ingredients. If you do try it with tahini, let us know what you find. Made this pretty much exactly how the recipe called for, turned out pretty good! Just a hair too spicy for me, i think next time i may cut back the cumin just a tiny bit and omit the cayenne altogether just to tone it down a notch. Great idea using the almond butter! Thanks Chance. Good point. Good suggestion for those who are hypersensitive to spices. I haven’t had any complaints about this being too spicy from the many people who have tried it or who I’ve made it for, but thankfully this is very adaptable to individual tastes. Hummus is one of my favourite things! is your choice of almond butter over tahini a flavor choice or is tahini not paleo? That’s a great question. I haven’t actually made this one with tahini in such a long time that I almost don’t remember haha. This is seasoned for almond butter. Who doesn’t have almond butter and cauliflower in their paleo kitchen always? And I believe almond butter is cheaper. I have read some things about seeds (tahini is made of sesame seeds) being more inflammatory, but that really wasn’t part of the decision. Short answer: flavor and cost. And availability. Would frozen boiled cauliflower work? Thanks! Please let me know what you find if you do. Curious about flavor and texture due to water content. But actually, probably just a few days in the fridge. I don’t know how well it would freeze either. But if you are worried about running out of uses before finishing it, try jazzing it up with some of my other paleo hummus recipes. lovely yummy recipe for breakfast.